Roooooooolllllllling Staaaaaaaart! Yeah that’s right Arcade racer fans, Daytona USA has returned. Not in a new fancy flame of glory, but in its old classic but cleaned up HD self. Start your engines for a cruise down memory lane. Let’s face it, if you were ever at an arcade, which, most of us gamers have been at some point in our childhood there was a select few games to play. Well, there was plenty to play, but only really a few actually worth repeatedly playing. If you felt like bringing out the lead, it was Time Crisis, for the later years it was also House of the Dead, or even a personal favourite Crisis Zone (The sub machine gun peripheral was absolutely huge!) But was satisfying nonetheless. However if you wanted to quench a need for speed, it was one of two games. 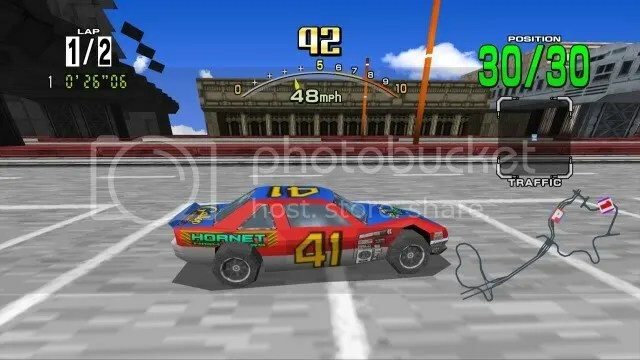 Many may have jumped for Sega Rally, but just as many people would have preferred their hard earned pocket money to Daytona USA, the first in the arcade series of NASCAR racing. Scrap Metal is the second in line from the Xbox House Party special launch leading up to the free release of the Xbox Live Arcade Game Room hitting our virtual stores at the end of this month. Following the success of Slick Entertainments first arcade title n+, have the guys there pulled off another great popular arcade release? It’s been quite awhile since I’ve played a top down racer; already it invokes memories of old PSX games like Micro Machines V6 and the like. So already Scrap Metal gets into my good books. The game bases itself around racing and weapon based mayhem. Each vehicle has a specific weapon, which can vary from chainsaws, machine guns, grenade launchers and more. Each weapon gives the cars an individual edge in races or even suiting more to your preferred playing style. 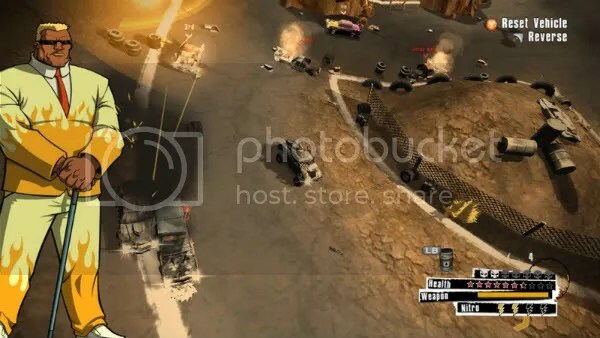 Also focusing around the Demolition Derby style of game play, which I feel has been sorely missed and overlooked in the new generation of video games, you can also use your own vehicle as a weapon hitting nasty speeds and plowing it through your unlucky opponent making for some fun and crazy events. The single player races consist of some traditional racing modes you’d see in most games. Including that of the obvious standard race, and others like Elimination races (the last around the track kind, not last man standing, which in fact is also in the game). As well as those are the demolition derbies and the aforementioned Last Man events. There are also some ‘story based’ events which mix up the racing combat. 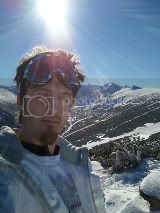 Each as you progress delivering new and crazy destructive happenings which always bring a smile to your face. Unlocking vehicles really depends on how brutal of a racer you are. See a vehicle you don’t currently have whilst racing in an event? Scrap it! Unload hell into that particular car and reduce it to nothing but a steering wheel and a seat to make sure you have one waiting for you when you finish that race. Turning your competitors into scrap metal really has its rewards! There’s a surprising amount of vehicles in the game, all varying over different types, from Sports cars to Monster trucks to even hovercrafts. Throw in a couple of shotgun equipped racing buggies and a bulldozer or three, and we’ve got ourselves a Scrap Metal party! The vehicles available are also quite well customizable, complete with colour schemes, paint jobs and little accessories, there’s plenty available to keep your ride looking cool, and more importantly, stand out amongst the players online. Unfortunately, you’re only allowed to keep four cars in your garage, this is a bit of a shame as it would be great to have at least one of each of the vehicles all customized and upgraded with our points from winning events. But we have to pick and chose between having four at a time. Even more damage to the blow, your upgrades on that vehicle will disappear entirely, even if you grabbed yourself another scrap version at a later date. You’re going to find yourself forking out for the upgrades again. 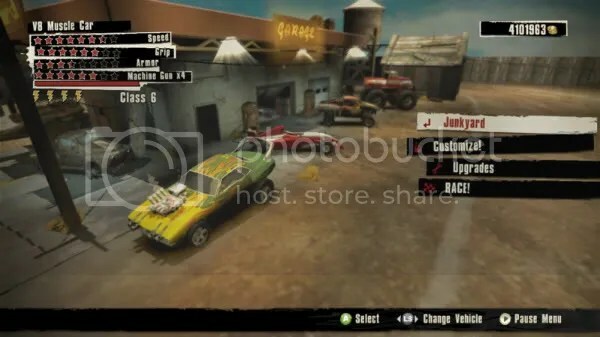 Online consists of the standard races, derbies and new game type King of the Hill. Sadly, this is one of the small things that let the game down. The lobbies support 8 racers, but only 4 of them are online players, the other 4 must be A.I. This really restricts the amount of friends you can have say in a party playing this, and doesn’t work the other way in replacing online people with more A.I. characters. Whilst the addition of A.I. players online is a great feature, capping the online players to 4 is one hell of a restriction for a large group of mates. The handling of the cars is very well spread out. You’re given a choice of 2 very different button maps. One being the traditional racing. With triggers for go and brake etc, and the other a more arcade style you’d more commonly see with games like Geometry Wars where the left stick will control direction and speed. Either one is very easy to pick up and get a good feel of each car to help you find your true rumbling hunk of junk and get it right in on the action. The tracks are fun and all vary in size and setting, there’s a race and a derby version of each track and will test some of your skill as you’ll also be keeping a close eye on your opponents. The game comes complete in its little package with great visuals and sounds to boot. If a little bit of rock isn’t your cup of tea whilst shooting and destroying fellow racers than your welcome to change it to something more suitable via your dashboard. The visuals though are very clean and detailed, as are the tracks with plenty of roadside obstacles for you to get involved in the carnage. Who knew a load of tires could cause so much hassle? Not to forget when there’s car parts and even wrecks out on the field to cause you trouble. The game’s achievements are simply a little lazy. With 80% of them being just to finish the boss races at the end of a section, the others being a 100% complete achievement the other 15% of achievements are online only achievements. Making there no real reward for upgrading your cars or other skill based rewards. There are however 2 avatar rewards available for your unlocking pleasure. The single player is dangerous territory. Whilst there are 10 separate sections with usually 8 events in each. If you get too caught up in the demolition you’ll find yourself quite far in the game from the get go. Once the main campaign is complete, there’s also no other single player additions. Besides playing through them again for all the gold medals. Besides that, it’s off to the multiplayer you go. Or perhaps some future downloadable content? 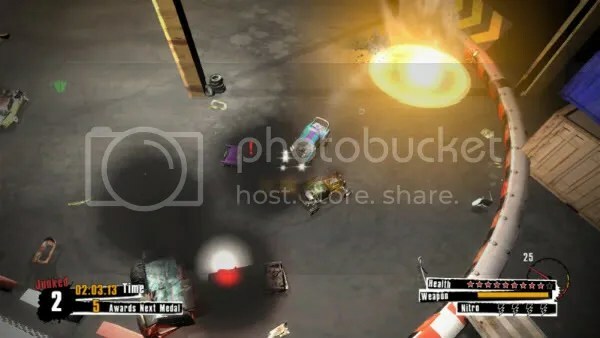 Scrap Metal is a great little party game, both being really great fun off and online, the game only has a few points including short single player and only 4 players online multiplayer, but is more than enough that we can look the other way for the sake of such a good arcade title. 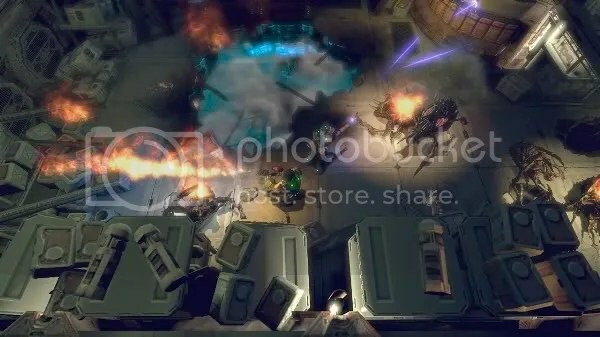 The game has been hinted at downloadable content to support it after release so we can only hope for more scrap metal mash-ups to get involved in, in the future. Take a look at any of the screenshots accompanying this review for Slide Colors and you’ll instantly begin reeling off tones of different arcade puzzle games you’ve played before and think this is impersonating. I wont blame you, as at the time before playing, my research led me to assume I was about to play Bejeweled or something of that nature. Whilst there are similarities, I was in for a bit of a shock. Many of you would have played that of Bejeweled, or something similar. Join 3 of the same blocks together, ta da, you’re a winner. So you can imagine my surprise when I found myself a block to move into a trio to find that entire row shifted along with it. Yeah, I was treated with my glorious explosion and the need to find more of the same, but wha?! I’ve got full control of the board! The games appearance is very smooth and has a bit of an old school arcade style to it. 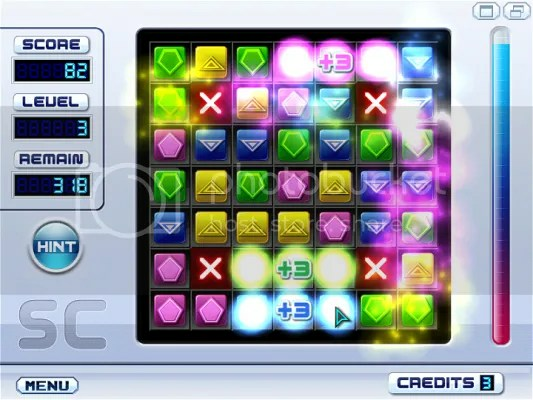 First type is the real puzzle game that were talking about, which involves usually a sparingly empty grid with a selection of different colored boxes and a square on the grid matching that color. Using your full control of both the rows and columns, you must make sure every box gets in the corresponding grid slot. On paper, this sounds insultingly easy. However once you get a couple of levels in. You’ll find yourself with more boxes, less time, and a lot more moving about when you start sliding those colors around, maximum brain power needed here folks. Time Attack is a little more familiar. In which players must make combinations of 3 or more of the same icon using all the moveable rows and columns. Doing so earns points, and you must earn a specific number of points to go to the next round. As you go, you’ll find more ways of helping like, clearing entire rows and columns for points and some boxes which prevent those rows with the boxes in from being moved at all. The last game type is basically just the normal game. 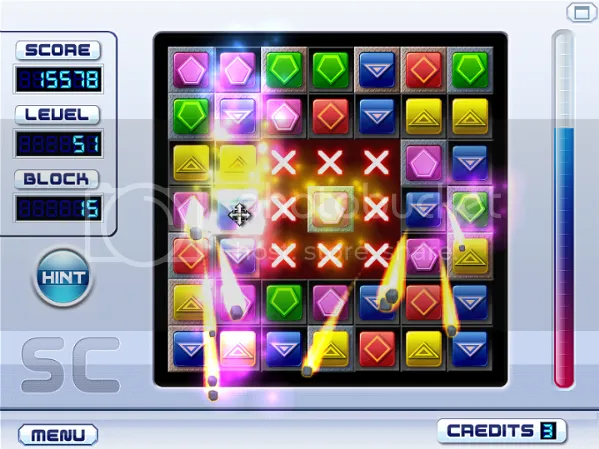 However progressing to the next level requires you to have made at least one combo on every block in the grid. Whilst there are unlimited amounts of moves you can make. The clock ticking will keep you on your toes to make sure you get all the grids lights knocked out in time. It’s a first for XboxLiveAddicts to be reviewing an Indie Developed game available off the Marketplace, and hopefully won’t be the last. The game sadly doesn’t scream out any form of replayablity, nor is it really that rewarding to play. On top of this, the website claims the game has achievements. However the achievements screen is only available as ‘awards’ in the menu and there’s no achievement score anywhere in the game. So whilst definitely worth a demo to see if it grabs you, you’ll want to keep an eye out for the developer, who hopefully has more to come.